Nissin brake parts give the quality your bike really deserves, the direct grip and quick response give you the most secure feeling on the road. As a premium brand, Nissin always offers high quality racing parts at decent cafe racer prices! Is not that what we all want? 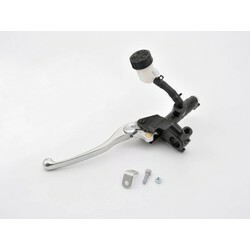 This clutch lever from Nissin gives you a really fast response, a perfect grip, a recognizable look and a great switching performance. With its 5/8" system, the liquid is quickly flushed through the entire system, allowing it to react quickly. The easily adjustable handle gives each rider his own personal perfect riding position.